Electronic poll book options are vast. The AskED® ePollbook from Robis Elections uses advanced technology to automate and speed up the voter check-in process for maximum electronic poll book efficiency. Our electronic poll book is versatile and easy-to-use by simplifying the election process with Election Decision Support™ that displays step-by-step instructions on screen to guide pollworker to the correct action. The AskED ePollbook features a user-friendly interface that speeds up voter check-in, reduces lines and reduces unknowns. Automate multiple processes with the Robis Election’s electronic poll book solution and find more efficiencies. Looking up voters with an electronic poll book is not only faster than looking through paper-based rosters, it can also speed up the check-in process for any voter circumstance. The AskED ePollbook features the most user-friendly interface. Displays step-by-step instructions on screen to guide pollworker to the correct action every time. Utilizing a built-in camera or separate scan gun available to quickly look up voters based on a variety of ID’s. Utilizing a touch-screen or separate signature pad. Print the correct ballot style for each voter on the spot with an electronic poll book. The AskED ePollbook can even print different ballots for provisional voters if desired so that they can’t accidentally go through the tabulators. The AskED ePollbook is easy-to-use by guiding election staff through simple “yes” or “no” questions to determine voters’ eligibility. Opinions and guesswork are removed from the equation, reducing errors and minimizing the need for time-consuming provisional ballots. 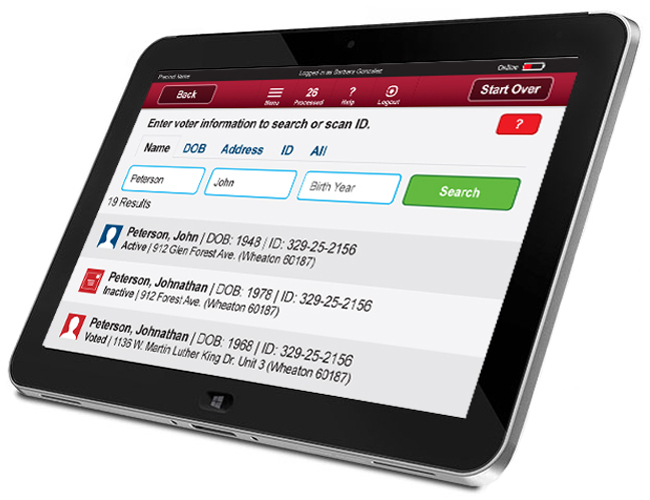 Lookup and validate voter using the AskED Election Decision Support system. Have voter confirm their identity. Hand the voter their correct ballot.